The global wholesale bandwidth market is influenced by many factors—some that change the face of the industry and others that contribute a certain measure of predictability. The industry is perpetually marked by the impetus to keep innovation and cost competitiveness ahead of inevitable price erosion. Overall, global bandwidth demand continues to grow, spurring terrestrial and submarine cable network operators to undertake extensive network upgrades and deployments. 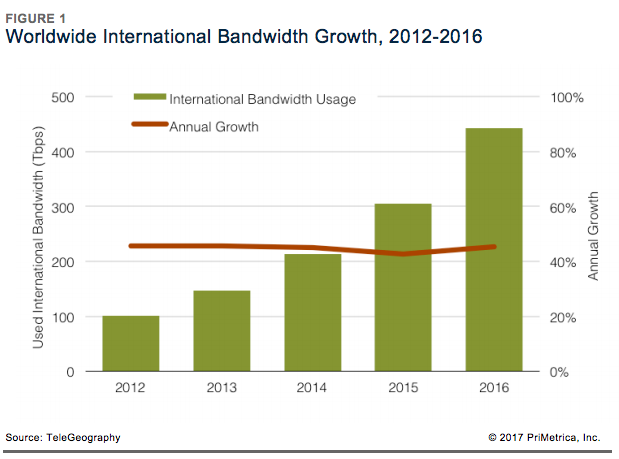 Globally, demand for international bandwidth increased at a rate of 45 percent in 2016. The amount of capacity deployed on international internet, private, and switched voice networks doubled between 2014 and 2016, rising to 443 Tbps. 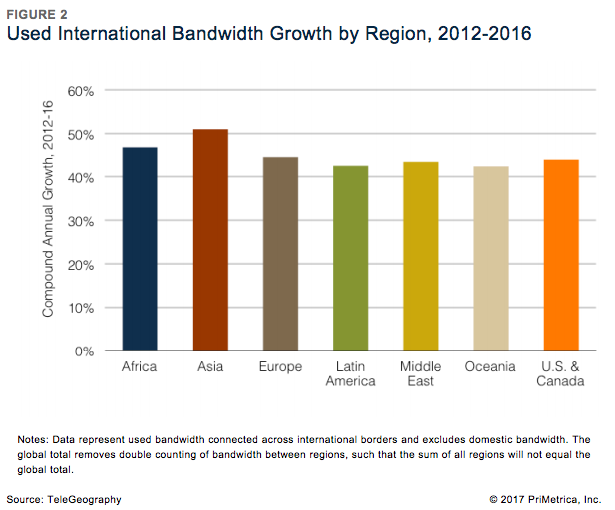 The growth of used international bandwidth is similar between regions. The pace of growth has been strongest on links connected to Asia, which experienced a compound annual growth rate of 51 percent between 2012 and 2016. Growth rates in other regions were only slightly slower, ranging in a narrow band between 42 percent and 47 percent compound annual growth. The U.S. & Canada retain a sizable advantage for providing inter-regional capacity. In 2016, 82 percent of used inter-regional bandwidth was connected to the U.S. & Canada. This share is down from 96 percent in 2005. 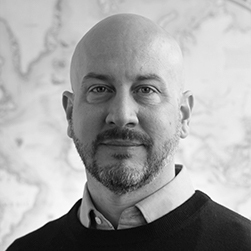 The reduction in dependence on connectivity to North America is largely attributed to an influx of new submarine cables linking Europe to Africa, the Middle East, and Asia, shifting connectivity toward Europe. The internet’s share of usage is waning; having accounted for 80 percent of total usage in 2010, the internet’s share has declined to 54 percent in 2016.
International internet capacity has accounted for the majority of international bandwidth usage since 2002. 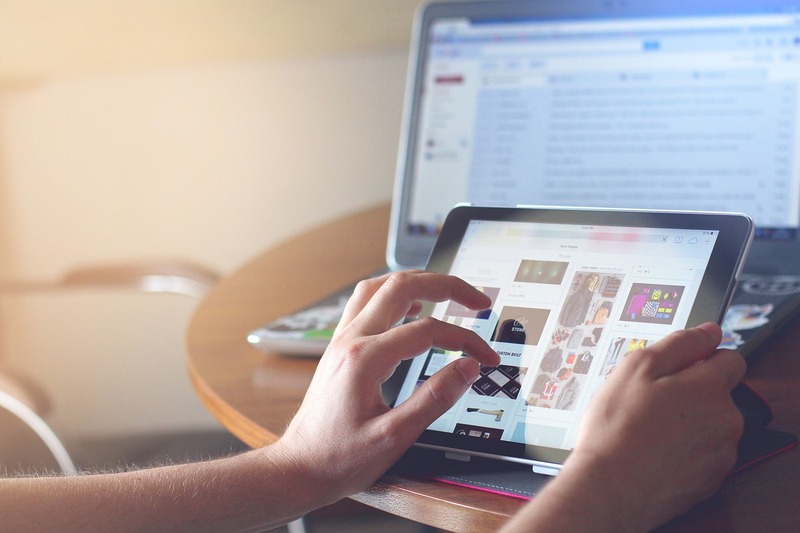 Nonetheless, the internet’s share of usage is waning; having accounted for 80 percent of total usage in 2010, the internet’s share has declined to 54 percent in 2016. The amount of capacity deployed by content providers has outpaced that of all other customers of international bandwidth in recent years. Between 2012 and 2016 the amount of international capacity deployed by companies such as Google, Facebook, Microsoft, and Amazon has risen 14-fold to 170 Tbps. In contrast, international capacity deployed by all other operators rose only threefold, to 273 Tbps. Our Global Bandwidth Research Service digs even deeper. Download the latest executive summary of this report to learn more about major routes, used international bandwidth by source, pricing, and market outlook.